Discover 48 rooms and suites with a soothing color palette and spectacular themes. Orbis theme is a special concept in accommodation, pioneering a tradition of corporate hospitality and setting a premium on discreet efficiency and business-related services. Thoughtfully designed workspaces and a host of amenities make these rooms the perfect choice for the discerning business traveler. These elegant living spaces will surely match the warmth and comfort of your home. The Deluxe Suite covering 450 square feet is luxuriously appointed. The bedroom is spacious and sets a warm tone with use of beige, caramel and cheeky brown and modern circular themed roof lends it a vibrant look. This is a perfect choice for big families or a group who wish to stay together. We make it easy for your family/ friends to stretch out with the two connecting rooms. 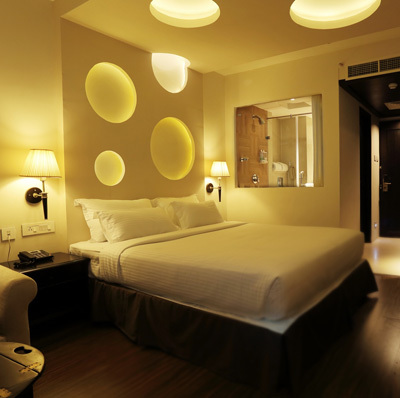 We anticipate your every need with at-most care to make your stay comfortable and peaceful. 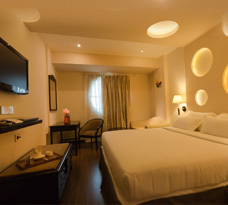 It includes two deluxe rooms connected to each other, both rooms individually having its own amenities as in deluxe rooms. The 500 square feet spacious suite is a modern product with many elements of classic luxury. The 100 square feet living area is elegantly furnished with subtle smoothing colors of beige, wood and caramel tones. 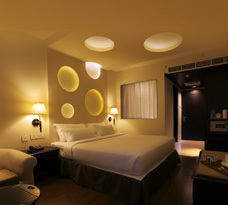 The 400 square feet bedroom is also spacious with a comfortable and luxurious bed. 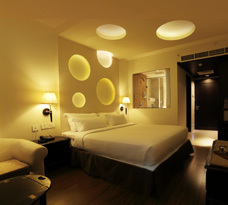 The suite has a palette predominantly of beige with contrasts of royal brown and modern artwork. This imbues the space with vibrancy. Some of the services and facilities above may not be available on 24-hours basis or without advance request. Fees on few facilities/services may apply.